Chinese horoscope compatibility predicts that the Dog Snake compatibility can be a tough one, though not impossible. The Dog is a loyal, but unpredictable Chinese zodiac sign that holds itself firmly to a high standard of behavior. Dogs often have trouble trusting that others are being honest or that they will hold themselves to their word. They are often called on as mediators and can be very successful diplomats. However, Dog men and women can also be quite judgmental and inflexibly dogmatic. This is exacerbated by their tendency to avoid idle banter and skew all conversations towards things they care about deeply. This means any disagreement can rapidly devolve into a shouting match. They tend to be emotional, temperamental, and anxiety prone. When it all gets too much to bear, a Dog man or woman will find themselves running off to be alone and re-center itself. The Snake is intuitive, analytical, and intellectual. This Chinese astrology sign is the epitome of think before you act, preferring to weigh every option before committing. The Snake man or woman is neither introverted, nor lazy. They are rather more active mentally than physically. They would rather plan and move with purpose than dive headfirst into a situation on the premise that immediate action is better than taking time to think it through. The Dog and Snake relationship can work out if both can make some adjustments to their lifestyle. The love compatibility in this zodiac match can be better if the couple is ready to make it work. The Snake Chinese sign is charismatic, sensuous, and often quite seductive. Despite their penchant and talent for socialization, they are most at home away from the world in a place of relative seclusion and peace. The Dog can be quite at home here, but will constantly feel the need to be up and doing things. The high energy of the male or female Dog can be quite good for the Snake, who does feel the need for socialization and companionship. In return the male or female Snake can provide a stable and reliable base for their Dog mate. The Dog and Snake soulmates get along famously and are likely to be used as examples of good relationships by others. When the Dog and Snake start dating, they are likely to be quite attracted to each other. There are a few pitfalls to watch out for in this pairing. Firstly, the relative energy levels of these two Chinese signs are vastly different. The Snake may feel that the Dog is not capable of sitting still and relaxing for even five minutes. The Chinese zodiac sign Dog may feel that the Snake is lethargic or lazy. Secondly, the emotional instability of both signs can cause some quite dramatic scenes in the Dog Snake marriage. The Dog, from time to time, will feel overwhelmed with insecurities and will flee to be alone and regain its center. The Snake, meanwhile, is prone to jealousy and suspicion. This can easily be overcome as long as communication is kept open. The Dog is not likely to run away and not come back; this would go against their principles. The Snake might not really be jealous at all, just a touch insecure. But this is a very serious issue and can lead to a breakup. But when the dog and snake are in love, nothing matters! Even in bed, the dog snake compatibility will be sexually stimulating and full of pleasure, predicts Chinese zodiac compatibility. The Dog and Snake friendship can likely to form an equal partnership in business that can be quite successful. Both signs are natural diplomats and quite able to make most potential partners or customers comfortable. The Dog has a severe aversion to people who don’t tell the truth. This is often seen as a refreshing honesty and is likely to make any Dog Snake compatibility a strong and lasting one. The Dog may do well here to take the lead in any travel that needs be done, while the Snake runs the office. 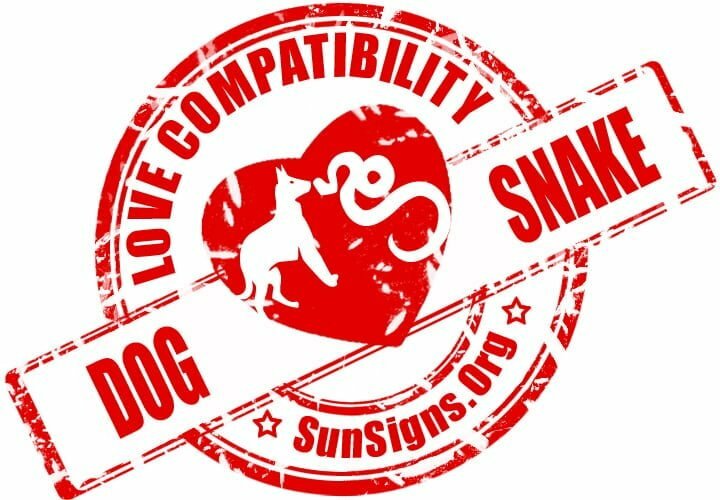 Dog & Snake Chinese Horoscope Compatibility Rated 3 Hearts!